On March 2, 2016, The Chicago Department of Transportation (CDOT) released its revision of the Rules and Regulations for Construction in the Public Way, a comprehensive manual which any contractor, utility, excavator, or other professional must comply with in order to obtain permits and perform construction anywhere in the public way of Chicago. This mind-bogglingly dense manuscript weighs in at a whopping 314 pages (with an additional 9 appendices) and covers everything from abandoned facilities, pavement coring, excavation methods, trench backfill, asphalt restoration, and median planters to wheelchair ramps, sidewalk maintenance and more. So is there a way to ease the processes of utility locating and construction, especially in a sprawling metropolis like Chicago that has congested easements, almost 30 stakeholders to account for, and a labyrinthine nest of live and abandoned facilities under its streets? As we will show in the article below, Chicago has indeed come up with a system that makes lives easier for utility workers and contractors in the city, and hopefully reduces damages at the same time. 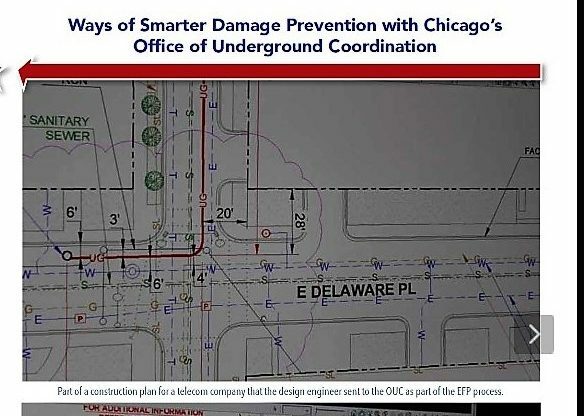 To deal with the overwhelming scope and complexities of utility construction, maintenance and oversight in a city as large as Chicago, CDOT created the Office of Underground Coordination (OUC) within its Division of Infrastructure Management. The OUC is now responsible for all requests regarding existing utility information, and the review or approval of any construction work in or adjacent to the Public Way, also known as Existing Facility Protection (EFP). The OUC also works with the permit office to oversee any construction projects by public utilities, and is in charge of protecting all city surface and subsurface infrastructure from any construction related damages. Before being issued permits by CDOT, any proposed construction projects must first be processed through the OUC. CHECK OUT MORE OUT ABOUT THE OUC AND OTHER GREAT ARTICLES HERE!